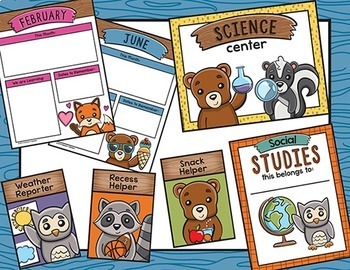 This woodland themed classroom decor pack has everything you need to get ready for the new year! There are editable pages included in packet, you can check out the preview for more details and to see more visuals. 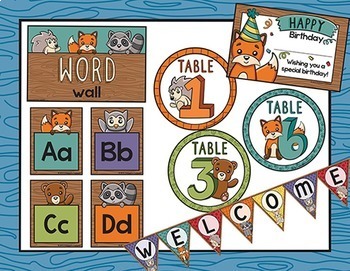 Note: The Woodland Classroom Job Labels and Woodland Classroom Multi-Purpose Labels from our store is included in this pack. Weather Chart: Hows the Weather Poster with 12 weather squares. 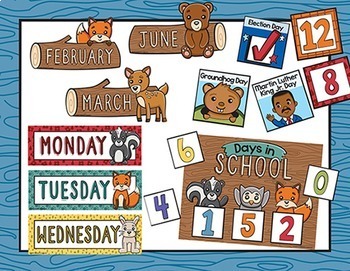 The poster measures 8.5" by 11"
Birthday Bulletin Board Displays: One for each month and measures 8.5" by 11". Monthly Newsletters: One for each month andand measures 8.5" by 11". They come in color and black and white. Desk Name Tags: comes in different styles for early and upper elementary. Each tag measures 10.25" by 3.6"
Word Wall: Word wall poster and letters A-Z. The poster measures 11" by 7" and each letter measures 3.5" by 4.5"
Classroom Job Labels: 24 jobs with matching illustration, comes 4 per page and each one measures 3.5" by 5". Labels included are: Recess Helper, Greeter, Calendar Helper, Paper Collector, Pet Caretaker, Weather Reporter, Tech Support, Door Opener, Snack Helper, Bathroom Monitor (one for girl and for boy), iPad Helper, Pencil Sharpener, Pledge Leader, Center Inspector, Errand Runner, Table Washer, Chair Stacker, Plant Monitor, Line Leader, Line Caboose, Light Monitor, Teacher's Helper, Lunch Helper, Trash Taker, Cubby Helper, Sweeper, and for blank job cards. Supply Labels: 36 supply labels with matching illustration, comes 6 per page and each one measures 4" by 3". Labels included are: scissors, pencils, paint brushes, glue, band-aids, crayons, paints, buttons, pens, rulers, paper clips, tape, highlighters, staples, markers, sharpies, ribbon, cups, dry erase markers, colored pencils, dice, crafts, books, backpacks, homework, pencil sharpeners, chalk, tissues, post-its, index cards, scrap paper, construction paper, red pens, erasers, calculators, journals, 6 blank labels. Birthday Goodies: Certificates to make students feel extra special on their birthday! Binder Covers: Subjects included are: Reading, Writing, Science, Social Studies, and Math. Schedule Cards: 39 schedule cards with matching illustration, comes 2 per page and each one measures 11" by 4.25". cards included are: writing, reading, math, science, social studies, music, art, computer lab, library, gym, language arts, P.E., journal, calendar time, field trip, morning work, lunch, recess, centers, snacks, nap, spelling, arrival, pack up, clean up, free choice, circle time, birthday, silent reading, testing, restroom, read aloud, health, school assembly, drama, party special guest, announcements, and 7 blank cards. Also includes a clock card to put next to schedule cards and an 11" by 7" Our Schedule Poster. Center Signs: 10 center signs each one measures 8.5" by 11". The centers included are: reading center, science center, writing center, math center, listening center, social studies center, computer center, art center, music center, games center. Number Posters: 1-20 number signs each one measures 8.5" by 11". Shape Posters: 13 shape posters each one measures 8.5" by 11". The shapes included are: square, circle, triangle, oval, rectangle, rhombus, diamond, star, pentagon, hexagon, octagon, parallelogram, and heart. Shape Posters" 12 color posters each one measures 8.5" by 11". The colors included are: green, yellow, blue, red, pink, orange purple, gray, brown, black, and white. Alphabet Posters: A-Z alphabet signs with matching illustration, each one measures 8.5" by 11". Banner Letters: A-Z and 1-10 banner letters, also includes punctuation ?,! measures 8" by 9". 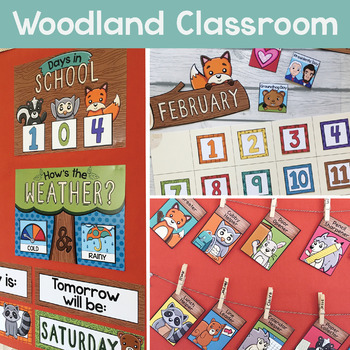 Woodland Classroom Decor Pack by Amy Hubbard is licensed under a Creative Commons Attribution-NonCommercial-NoDerivatives 4.0 International License.